Brick and mortar store owners can now get access to the same kind of analytics available to website admins. Shopper Tracker is a new product from Argentinian developer Agile Route built off of Microsoft Kinect. 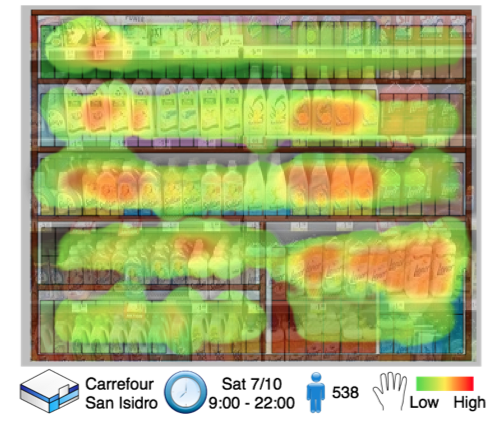 It analyzes customer movements to provide traffic flow analysis and heat maps indicating which shelves are attracting shoppers and which products they touch or take. This can be tied to conversion data by product SKU to help merchants optimize where products are placed within their stores. To attain similar market research, merchants typically have to pay observers or use equipment and surveys that are expensive, inaccurate, and influence the behavior of the people they’re studying. With Shopper Tracker, multiple shoppers can be simultaneously tracked around the clock. As it doesn’t cost much more to conduct longer studies, merchants can get more confident results and do A/B testing. Prism Skylabs, a company that debuted at our TechCrunch Disrupt conference, tries to pull similar traffic flow data from a store’s existing surveillance cameras. While Shopper Tracker requires an initial set up cost of buying several Kinect sensors, it provides much more specific activity about customer behavior. You can watch a demo video of Shopper Tracker in action here. Also, check out our past Kinect coverage for more exciting hacks and a look at Microsoft’s beautiful new ad for the Kinect APIs.